First stop this morning was Aberavon beach in the hope of seeing a Red Throated Diver out in the bay. I had no luck there due to the roughness of the sea but did pick up a raft of 51 Great Crested Grebes just off shore. 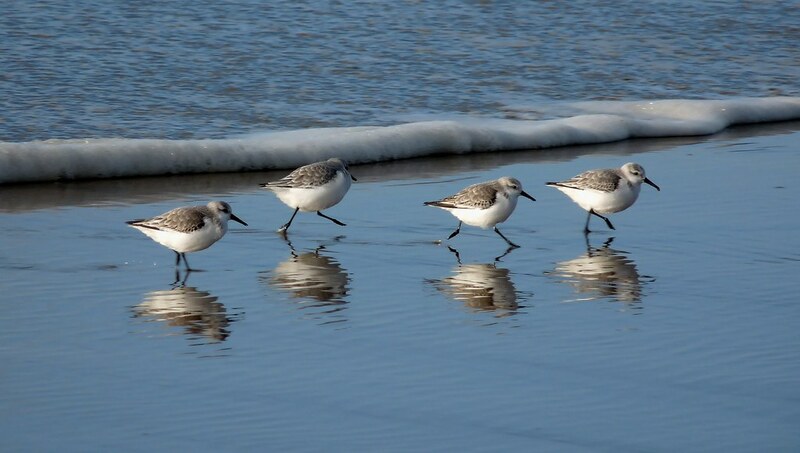 The real action however was to be found on the beach where around 200 Sanderlings were continually running back and forth in tandem with the waves. I love these birds purely for the way they move. 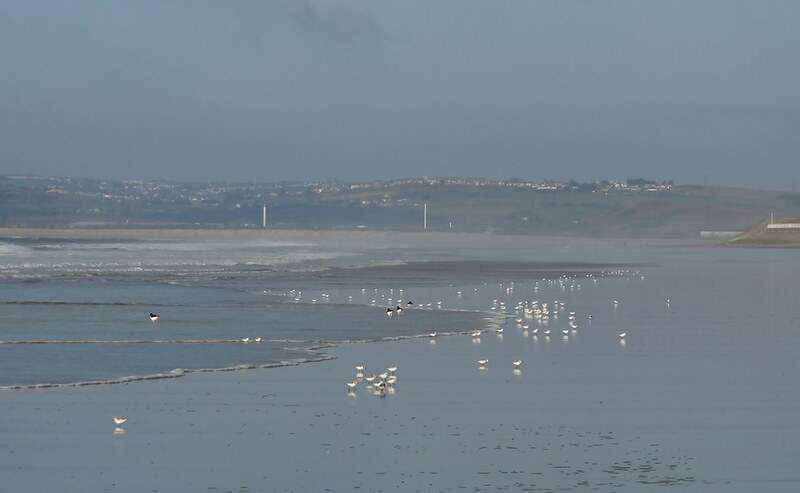 As if chasing and then being chased by the sea didn't offer enough amusement then the way in which they seem to glide across the sand surely does. Their legs move so fast that they are a blur but somehow their bodies always remain absolutely still. I couldn't get particularly close but was fortunate to have a small group run right past me. Even more fortunate was that I managed an action shot with my camera, something that I tend not to get right. Mixed in with the Sanderling were four Dunlin and three Oystercatchers. On the way out of Port Talbot I took what would turn out to be a very fortuitous wrong turn and ended up in the Baglan Energy Park (a business park to you and me). Here I found the old Brunel Dock, a place I have read about but never actually visited in person. The tide was out revealing plenty of mud although the only birds present were nine Redshank and a Grey Heron. The area looks to have massive potential though with an extensive reed bed and access right out to the mouth of the River Neath. Definitely a place to return to. For the afternoon we headed over to Rhossili Downs for what turned out to be a very wet walk (underfoot that is as the ground was completely saturated), stopping in at Bracelet Bay on the way to see 29 Mediterranean Gulls down on the rocks. The Downs themselves were almost completely bereft of bird life apart from a couple of Buzzards and various Ravens, Crows and Jackdaws. 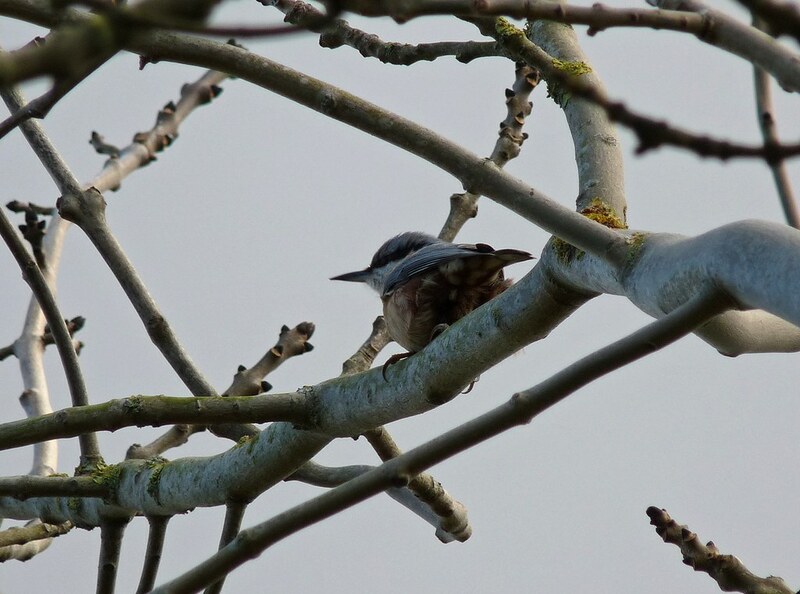 It wasn't until we got down to the bottom of White Moor that anything more interesting popped up in the shape of a Nuthatch. I have never seen this species in the area before so it was definitely a nice found. Things got better around Sluxton where a flock of some thirty Fieldfare were feeding in a crop field. A flushed Common Snipe was the last bird of a pretty quiet day.